Jenni's Jems: "Cut it Out"
It's that time again - The Less is more challenge! couldn't manage last week but making sure this week (but hoping it meets the criteria), rushed through the washing ironing( confess did a bit more folding than ironing) etc to have the afternoon to play!! hee he. Lots of male cards to make in the coming weeks and saw this free James bond download in a magazine and just had to give it a go.Took me ages to get it to resize and get it to the size I wanted but got there in the end. Started off with black card layered up the white and a strip of red.Cut out a circle using the spellbinders circle dies and two more in silver and red, added the sentiment and voila one male card . Hi Jenni, love this card ! What a fabulous and clever idea , just stunning. ps smooth and fold is a great way to iron eh?!!! Hola Jenni, what clever idea Jenni!! !, fantastic card and the sentiment is perfect,this card is fabulous for a man, i love it well done Jenni. This card looks great and has a very retro feel to it. What a fab idea for a male card! Brilliant! Great card. Simple clean lines but with lots of interest!! Jenni this is a fantastic idea and beautifully made! How cool - it's really fantastic. 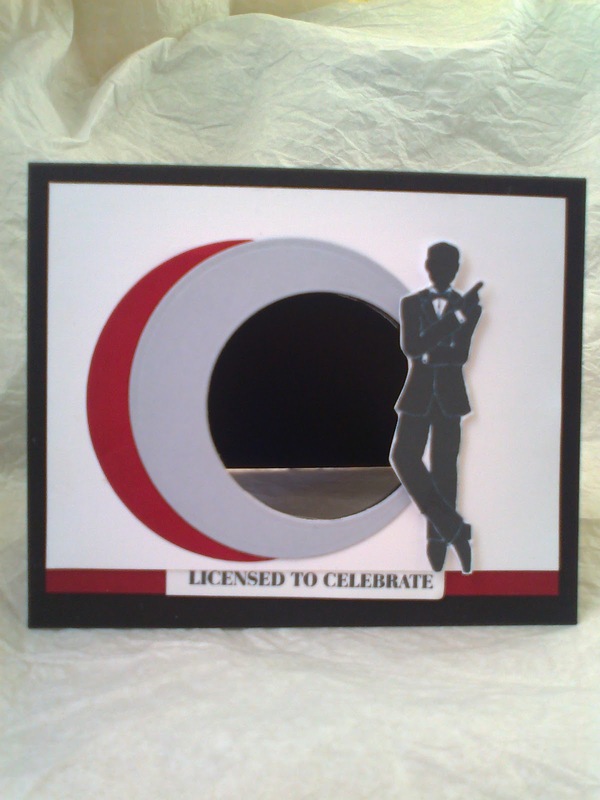 Fabulous card, love the James Bond! I downloaded that too but not used it yet. You made a fantastic card with it. Great card. Very clever sentiment. Brilliant card. Very clever design. A clever idea & a great image. Perfect for a fella. Oh wow, this is just great, it's a really great card for the male of the species. wow... what an awesome card!!! so coool!! Congrats being in the LIM showcase. You really deserve it! Fabulous!! Very creative. Love your card.